With any launch there’s always questions. Virgin Atlantic is moving into yet another decade of fierce airline competition, and as the rumour mill began to churn, “experts” couldn’t possibly see how the airline would manage to add in enough money maximising seats while also maintaining the features which make Virgin Atlantic so purple and different in a sea of blue. The first thing rumoured to go: the bar. Spoiler alert: It’s still there. Virgin Atlantic just went from the marmite of business class seats to a top ten stunner, in about five seconds flat. If you’re not British – the “marmite” bit means previously, you either loved the old Upper Class seat or hated it – nothing in between. 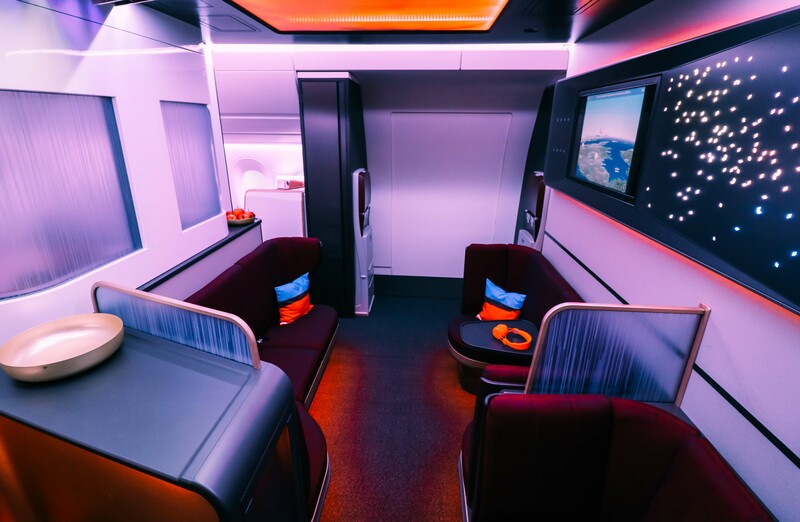 Fast forward to the present, and Virgin airline has unveiled one of the best seats in the business class skies and it’s headed for New York. Just FYI, every picture you see was taken by GSTP and are not press shots. This eccentric new A350 business class seat is uniquely Virgin the way afternoon tea is distinctly British. You could put it elsewhere, but it just wouldn’t feel quite right. It’s like Richard Branson learned how to use his Instagram filters and has a new spin on the colours we know and love him for already. If you ask us, it looks really good. Compared to the current “Upper Class” seats, it’s one giant leap. There are adjustable privacy screens at every seat. Every seat faces toward a window. USB and AC power ports at each seat. Every seat has direct aisle access. Every seat converts into a fully flat bed. If you needed to point a finger to the next closest thing, the Cathay Pacific A350 business class seat would be your answer, but it’s far from compatible. For starters, this seat is years younger, and if you really want to win the argument, look no further than where every seat points. Virgin fully customized this product, and it’s the only airline flying it. Does it have doors? No. Does it have screens which basically do the job? Yes. Virgin Atlantic made a conscious choice not to put “full” doors on these suites, though the capability to do so was obviously there from the design. Surprisingly, many airlines have noted customer service issues since introducing fully closed doors. In short, passengers close the door for privacy but then expect service. The crews obviously respect the privacy, but then people open their door to wonder why drinks haven’t been topped off or meals haven’t been served. These new seats feature what can best be described as half privacy doors, which effectively shut out everyone around you, but leave just enough aisle view for crew members passing through to offer a top up, or assist with something else. Let’s be honest, it’s probably about a top up. Airlines point centre seats inward toward each other for one reason, and one reason only: it saves space. Inward facing central seats, or staggered “in and out” configurations allow for at least another row to be added to the business cabin, but Virgin went a different way. According to the product design team lead by Daniel Kerzner, formerly a Starwood Hotels product innovator, customers in the middle love being close, but not too close. That, and basically everyone loves facing out to the windows. The sky is beautiful, after all. Oh and hot tip: the first row has extra bed room, which definitely makes it the row to shoot for on this Virgin Atlantic Airbus A350. This innovation not only gives passengers a better sense of the cabin and surroundings, but central passengers can get up with their tray table down. Yep, the tray table is toward the middle, so you can slip out the side. For those mixing afternoon tea, work and pleasure, this is a fantastic new feature. Words are one thing, actually sleeping on a plane is another. I tested the seat out in bed mode and aside from very good general comfort, my one big “oh, that’s great” was that the length of the bed which at up to 82” was much greater than expected. Another recently launched seat product is 79”, for reference. In speaking with Virgin, this is apparently due to the bowling ball effect. Rather than just stick a tape measure from one end to the other, Virgin will only measure length from the first place a bowling ball can roll to the last. There’s no mobile disco light system in each seat, but there are clever lighting features. Aside from standard reading lights, each seat panel has a button which allows you to turn the ambiance up or down. Basically, you can have lots of nice lighting all around you if you’re watching a movie, or if you want to pass out, you can just do that by turning it all off. Super-frequent flyers have one cross to bear with many seats, and that’s personal air vents. Virgin added multiple personal vent points to each seat, which help each passenger control their journey temperature while also enjoying fresher air. On a plane, that really helps. As hoped, entertainment screens are big and they are vividly sharp. In speaking with Daniel Kerzner, Virgin wanted to be amongst the most consistent in all cabins, and have installed 18.5” screens which work almost identically to the way iPads or other personal electronics do. When it comes to finding entertainment, the screen scrolls at a speed just like your favourite tablet and you can control the system with your own personal device. Yes, you read that correctly. You can wirelessly connect your phone to the entertainment system and tap away. Thanks to the new design which features content in each screen rather than on a huge system, if a screen isn’t working, which of course would never happen, a team member could simply snap a new screen in and replace it before the next flight, rather than disappointing future customers. It should also mean the end to “we’ll just need to reset the system”. The bar is now the loft, and unlike many pub rebrands this bar is so much better. In the previous iteration, there were simply a few barstools right next to each other, which could either be amazing or incredibly awkward. If someone was already at the bar, you were essentially forced to sit next to them. For many, it was beyond British social awkwardness. The new “Loft” is vastly superior. There’s a solo seat, there’s a seating area for two, and also one for three. If you’re a group – great. If you’re solo, you can wander over without any “getting to know you” pressure and if you’re a couple, there’s a pair of seats just for you. While that’s all wildly exciting, the game changers come in three forms. First, there are seat belts, which means you can relax in the area even during turbulence. Second, there are power ports too. But third, there’s an entertainment screen which can take up to 8 Bluetooth connections. You can use your own headphones, or a pair from Virgin to watch a movie at the bar remotely. In theory, you can even have someone DJ a silent disco for 8 passengers. If you see this happen, it was my idea, no matter what anyone else says. The Virgin Atlantic A350 is exciting in every cabin. Economy is laid out in a passenger-preferred 3x3x3 layout and the new entertainment screens are wicked fast. Premium Economy sees a next generation seat with even larger screens and of course, you now know everything about things in the pointy end. Virgin Atlantic is bringing the Airbus A350 to New York first, with flights kicking off in the third quarter of 2019. When we have an exact date, we’ll totally tell you. This is great! Thanks for sharing! I wouldn’t necessarily state the seats are revolutionary compared to other business class seats out there right now but I agree this will bring VS back to the top 10. The loft looks pretty cool and from what I see there are tables there too to place drinks on or to place laptops on if I want to do some work in a larger space. Well done Gilbert, knocked it out of the park with this review. Great photos. I’m going to say it – you are a much better writer than some (cough OMAAT). This has a large seating area….it is in no way a ‘bar’, this description is inaccurate. A bar is a counter across which refreshments are served and stocked full of drinks. This has no bar, merely extended seating with no dedicated drinking facility. That seems pretty clear from the pictures. I bet you’d be loads of fun to drink with… At the bar. Will there be different variations of cabins on different routes? For example, fly from Gatwick and there are generally around 12 Business Class seats on the 747.